Adrenaline junkies looking for a thrill might want to book a trip to China. 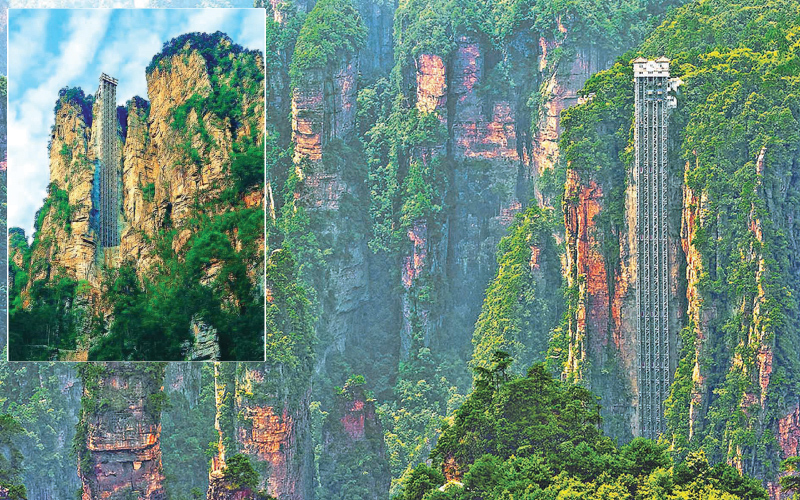 Rising up 1,070 feet (326 meters), the Bailong elevator is located in China’s picturesque Zhangjiajie National Forest Park. Also known as the Hundred Dragons Elevator, this feat of engineering holds the record as the World’s Tallest Outdoor Elevator. Completed in 2002, each of the three double-decker elevators rises up the side of a sandstone pillar to overlook the famed scenic and historic site of Wulingyuan. The area is also home to the rocks that inspired Avatar‘s Hallelujah Mountains of Pandora. For a fee, visitors can face their fears and move up the cliff, arriving at the top in just under 2 minutes. Each elevator can carry up to 50 passengers at a time, with a daily capacity of nearly 20,000 visitors. The Bailong elevator has seen its share of controversy, as it was finished the same year that Wulingyuan was named a UNESCO World Heritage Site. Many felt that the structure was out of place and damaging to the environment, while others in favor of the project noted that the elevator would relieve pressure on the already overcrowded mountain trails. As an added bonus, the elevator allows visitors to see many areas of the park that were previously only accessible by a dangerous mountain road that often took up to three hours to navigate. Many tourists stayed overnight to take in everything, but now that this barrier has been removed, the number of day travelers has increased. This has meant fewer restaurants and guesthouses on the mountain, which could be seen as another plus for lowering the environmental impact of tourism. The world’s tallest outdoor elevator did have to shut down for 10 months during the 2002/2003 season due to safety concerns, though. Now, the cars are fitted with special alarms to evacuate in case of earthquakes - which is essential in this part of China - and things are running smoothly once again. If you’re thinking of making the trip, just prepare for the long lines that may await you depending on the time of year. But, if you want to save a few hours hiking and don’t suffer from vertigo, it’s well worth the wait.